Tokyo is considering the deployment of SM-6 interceptors at its proposed ground-based Aegis Ashore installations. The Japanese government is considering equipping its two future ground-based Aegis Ashore systems with multi-purpose interceptors designed to stop cruise missiles, the Yomiuri Shimbun reports. As the number of Chinese military aircraft sighted in the skies around Japan is increasing, the Japanese military purportedly believes it necessary to arm Aegis Ashore sites, the land-based version of the Aegis Combat System, with the Standard Missile (SM) 6, next to the anti-ballistic missile SM-3 Block IIA interceptor. Tokyo is especially concerned over the growing presence of People’s Liberation Army Air Force (PLAAF) Xian H-6K long-range bombers near Japanese airspace. The bomber can be armed with CJ-20 subsonic land-attack cruise missiles with an estimated range of up to 1,500 miles. In the future, PLAAF bombers will also likely be fitted with nuclear-capable cruise missiles. Japan completed a study in May of this year concluding that the Aegis Ashore system is more cost effective for missile defense than purchasing the Terminal High Altitude Area Defense system. Manufactured by U.S. defense contractor Raytheon, SM 6 is a supersonic (Mach 3.5+) missile interceptor with an estimated range of over 180 miles. 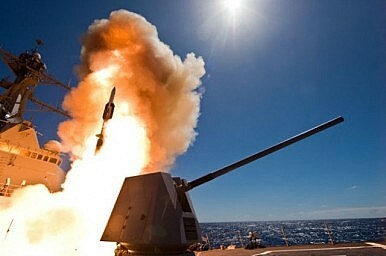 The missile was originally designed for anti-air warfare, anti-surface warfare missions. Yet in 2015, the missile was modified for terminal ballistic missile defense to supplement U.S. Navy SM-3 ballistic missile interceptors deployed at land-based Aegis Ashore sites and Aegis-equipped warships. It is likely that Japan will receive the upgraded SM 6 variant. Japan’s Aegis Ashore installations will not become operational until 2023. Beginning in 2018, however, SM 6 missiles will be deployed aboard Aegis-equipped Japan Maritime Self Defense Force (JMSDF) warships including the Atagao-class and Kongo-class destroyers for testing. “The Defense Ministry has requested ¥2.1 billion in next fiscal year’s budget to acquire SM-6 interceptors for experimental purposes,” the Yomiuri Shimbun writes. The SM 3 Block IIA, is the most advanced variant of the SM-3 ‘hit-to-kill’ interceptor and has been under joint development by the Raytheon and Japan’s Mitsubishi Heavy Industries since 2006 with Tokyo covering most research and development costs. It is designed to destroy short- to intermediate-range ballistic missile threats. The SM-3 has been successfully flight tested in February of this year when it destroyed a medium-range ballistic missile target. However, the missile failed another intercept test in June. Unlike the SM 3, the SM 6 would not be able to cover all of Japan and would likely be deployed to protect Tokyo and key military installations. Both interceptors theoretically have the capability to shoot down incoming North Korean ballistic missiles. In order for either missile to intercept a North Korean ballistic missile, the Aegis combat system would have to start tracking the missile in its ascent phase and launch interceptors before it overflies the Aegis ashore site. This will partially depend on the sharing of missile threat data. “The United States has (…) been working closely with the Republic of Korea Navy and the Japan Maritime Self-Defense Force to facilitate timely acquisition and sharing of North Korean ballistic missile data among the three navies to enhance the chances of a successful interception,” I wrote in August.